Looking up the valley toward Greenside you can see old miners' cottages up to the right, and more partly hidden by the trees. The road to the mine goes up past these. Imagine trudging up there to work early on a bitter Winter morning. I suspect they were less occupied with the scenery than we are today. 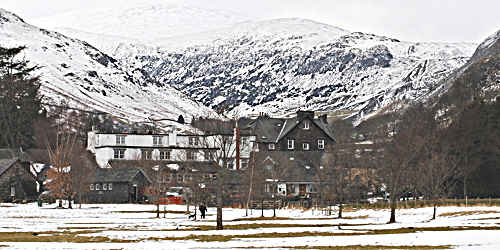 With all the tourist facilities down at the lake level it is easy to miss the fact that the majority of the village, the older part of Glenridding, for centuries did not exist for visitors. The cottages were then the homes of miners working deep inside the surrounding mountains. Greenside Mine between the 1690s and the 1960s produced thousands of tons of lead and silver, but the miners' cottages are now almost entirely given over to holiday accommodation. The following photograph was meant to show the remaining mine buildings but on walking up especially to take a winter photo from the opposite side of the valley the weather obliged with a snowstorm, so no photo. Instead, here is a view up to the valley from the lake. The mine workings, not visible here, are in the far distance on the right. A dismal afternoon with little colour, yes, but it's sometimes like that. People often have a mental image of mining that includes the pithead winding gear of deep coal mines. That was not how it was done in the Lake District. The miners tunnelled horizontally into the mountain sides. Many of the well-known Lake District mountains contain honeycombs of tunnels dug out over the centuries. Like the shepherds with their Herdwick fell sheep these men of the mountains were tough. There were also many smaller mines both around Glenridding and beyond Patterdale at Hartsop and by Brothers Water. 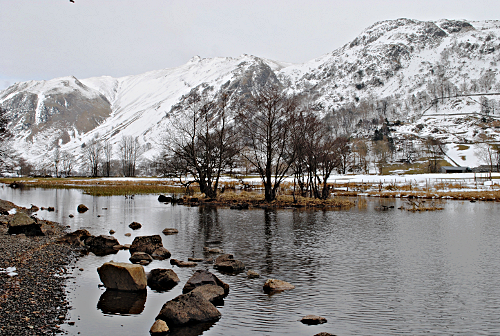 The crags in this photograph looking over the foot of Brothers Water are penetrated by old miners' tunnels, but it is doubtful that there will ever again be mining around Ullswater.